I don’t have many regrets in life but there is one thing I regret not putting in my cookbook – Kaszotto. 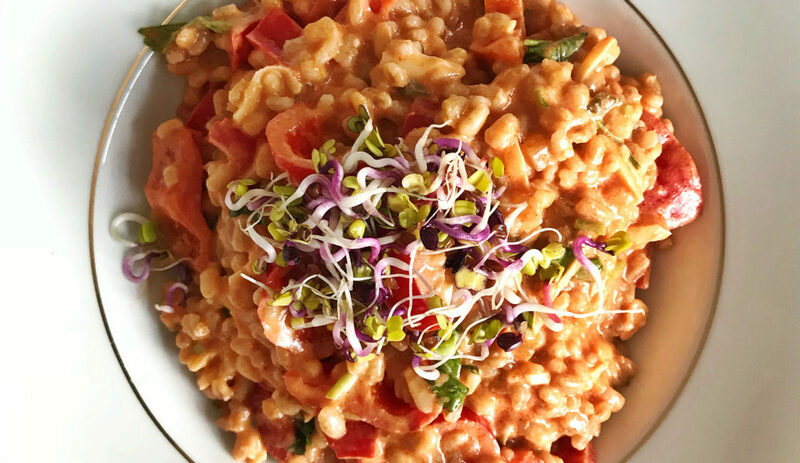 They are really popular in Poland and the perfect thing to cook when you don’t have much in the fridge – much like it’s predecessor, the risotto. As you may have guessed, “kaszotto” is made with “kasza” rather than rice. There are many different types of “kasza” – I would say the word encompasses all grains, but google translate translates it literally as “groats”. This “kaszotto” is made from pearl barley – one of my favourite grains (although I would be hard pressed to choose my actual favourite, because each one is so unique). This “kaszotto” came about exactly in the situation described up there – just a few things in the fridge, waiting for our weekly Farmdrop order to arrive. I usually just pull these meals together without as much as a though of taking a picture, then regret it in the aftermath, exactly about the time I finish eating and we are remarking on how tasty that was… before promptly forgetting the entire recipe. I have a toddler and I’m still breastfeeding – my brain is like a sieve these days. Today, I took a quick picture as it looked rather pretty, decorated with some leftover radish sprouts (which my toddler duly picked out of her plate). My partner came home about an hour later and warmed it up and asked me later what deliciousness that was… I said it was everything we had left in the house thrown together, but that I thought it turned out rather good. He said “Some of your best meals are ones that you throw together with whatever we have left over. Please don’t forget this one”, and so here I am blogging about it. I haven’t blogged enough over the last couple of years, since publishing the book. The publicity for the book (it’s available in 7 countries now by the way!) the baby, the house move, the renovations, the brain (not working properly) all took their toll. Now I’m remembering how much I always enjoyed blogging and how useful a tool it was for noting down all these little every day recipes and details, how lovely it is to look back in time and remember. Fry the shallot for a minute or two in a heavy bottomed pan, then add the (rinsed) pearl barley. Cover in water (so you have about a centimetre over the top) and bring to the boil. Take the heat right down, cover the pan and allow to cook for 20min or until all the water is absorbed. Then leave it to steam. You can wrap it in a towel and put it in a warm place (like a bed) if so inclined. Meanwhile, on a separate pan, heat a tablespoon or so of rapeseed oil and fry the garlic and the red pepper slithers until soft. To the pepper pan add some paprika and the tomato purée along with a generous splash of water. Stir it all in. Add the coriander and fry for another couple of minutes then turn the heat off. Add tiny gherkin cubes, the cream, the mustard and season. After your kasza has finished steaming (20min is enough), add the sauce and heat altogether. Finish off with a generous helping of grated cheese, like pecorino, or whatever else you have lying about.